Today went see the movie Jumanji. Welcome to the jungle Starting Dwayne the rock Johnson Kevin Hart Jack Black Karen Gillan Madison Iseman director. Jake Kasden. I tell this was fun movie watch “Jumanji Welcome to the Jungle,” about a group of teenagers who turn into videogame characters, is a sequel to the 1995 Robin Williams hit “Jumanji,” a remake . Very entertaining movie and funny to watching enjoy watching this movie it was fantastic . Dwayne The Rock Johnson was awesome in enjoy on screen with Kevin Hart Jack Black Karen Gillan Madison Iseman they awesome to out movie . 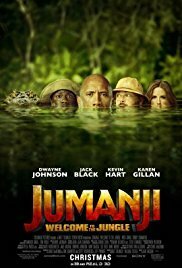 This movie reviews Jumanji welcome to jungle starting Dwayne the rock Johnson Kevin Hart Jack Black Karen Gillan Madison Iseman director Jack Kasden. This entry was posted in ACTION, actor movie review, comdy movie reviews, COMEDY, Jumji, Uncategorized by Movie talk news with Antonio Gutierrez. Bookmark the permalink.